This past winter I didn’t do much in the way of pool maintenance. So what? So now I have green pool water. That’s what. This is the third year we’ve lived in our house. The first year was really all about learning how to maintain a pool and keeping up with the pool chemicals. I did pretty well, too. Last year we enjoyed a full season of crystal clear water. Green pool water happened quickly and came as a surprise. March 24, 2012: The top picture was taken yesterday. As I go through this whole process, I’ll be taking more pictures and will posting my progress as I go along. So yesterday I cleaned the pool filters. I have a Hayward canister type filter system, so that was a simple matter of taking the filters to the car wash and hosing them down. I put the filters back in and started up the pump and set it for 24 hours (constant) filtration. I tossed in several pool chemicals like acid to bring the ph down and some soda ash to get the alkalinity up… and my last two chlorine tabs. March 25, 2012: Today I bought some shock and a 35 pound bucket of chlorine tabs. I got a couple of free one pound shock bags and tossed one directly into the water. I don’t think I’m too concerned yet what the chemical balance is yet, but I know the chlorine and free chlorine levels are pretty low so I felt okay with just adding it in at this point. The green pool water is still milky and very green, no noticeable change yet. I also netted as much of the small stuff that was floating around as I could too and ran my vacuum for about 4 hours. I have a Hayward Pool Vac Ultra. Love it. The plan tomorrow is to figure out which chemical will coagulate the dead algae so the filters will catch it. The green pool water turned into lime-green pool water. Day 3: Looks Like A Well Maintained Pool Already! March 26, 2012; Wow! Last night I went ahead and added 2 more pounds of shock since it seemed to be helping. This morning I walked out to this! the water is still milky looking, but I can see the bottom and the water is blue. I checked the filter housing and learned that the pressure went up about 11 pounds. The filters are obviously doing a good job again. I’ll need to clean them in the next couple of days – right away. I am amazed that all it took was pool shock therapy 🙂 to get the green pool water to a pleasant blue again. There are products that are designed to “grab” the inert materials that are making the water milky looking to help the filters catch it, so that will be the next task…probably right before cleaning the filters again. Technically it’s still pretty dirty, but I can see that green pool water can be cleaned easily with just a bit of attention. I ran my Hayward Pool Vac Ultra automatic pool vacuum for about 4 hours again today. 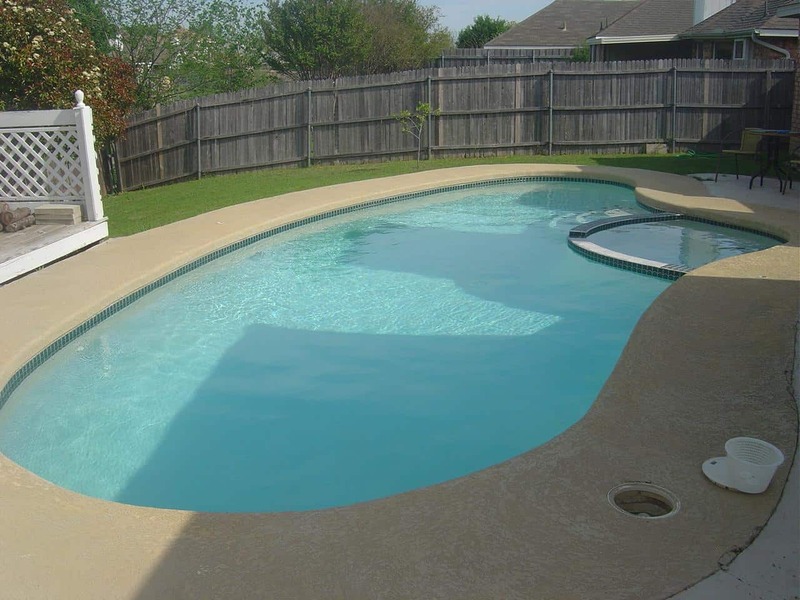 Clean And Ready To Swim In – No More Green Pool Water! So, green pool water isn’t horrible and it took 4 days of attention for about an hour per day to get this pool ready to swim in. Sorry this post isn’t more spectacular…but that’s good news, right? I don’t get paid by Yellow Out to promote their product. I just like it.